Create fantastic user experience with the UI controls included in the pack. See them implemented in the Online Demo. The slideshow control represents a gallery of images. 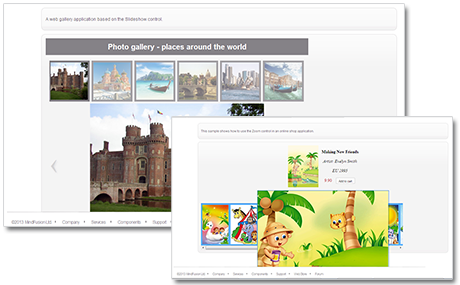 You can control the speed, with which images are changed, the size and position of the image tiles and whether the slideshow starts automatically by page load. At your disposal are also various properties for appearance customization, selection and a set of useful events. The Accordion control represents its items in sections that can be expanded or collapsed with a single mouse click. Its API includes various useful methods for manipulating the items like choosing the active item, selected an item by its index, retrieving all items in the control and more. 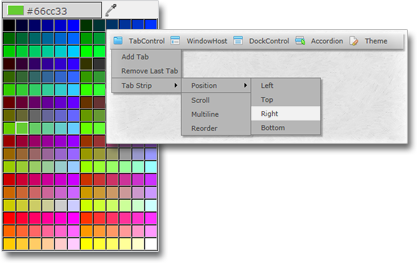 The TabControl lets you customize the height and alignment of the tab headers as well the type of tab scrolling. It can give you precise details about the active tab and its index or arrange its tabs in more than one row or column. The tab pages can have title and tool tip and can navigate to a URL when clicked. The control boasts the full set of features that let users bring to front, minimize, restore or send to the back a window. You can customize your window by choosing its title, icon or the URL that will be loaded when the window shows up. You can also change its visibility. The DockControl holds one or more dockable windows and can give you precise information about the active windows, the docked and the floating one. Each DockWindow within the host can be docked to either one of the four edges or to the center with a mouse drag or can be floating. 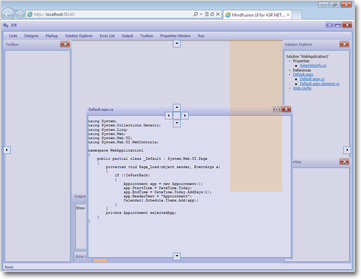 The DockWindow can also contain other windows. 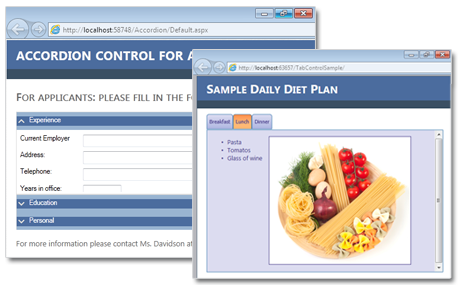 The menu control holds a collection of menu items and gives you programmatic access to each item. Each item can have a title, value and tool tip. You can set the URL of the page that will be loaded when the user clicks on the menu item. The control supports interactive creation and removal of items. MindFusion.ColorPickeris completely customizable - you can choose the PaletteMode, the selected color as well as its theme. The control raises event whenever the color is changed. The DatePicker control lets you choose the min and max dates that can be shown and the currently selected date. 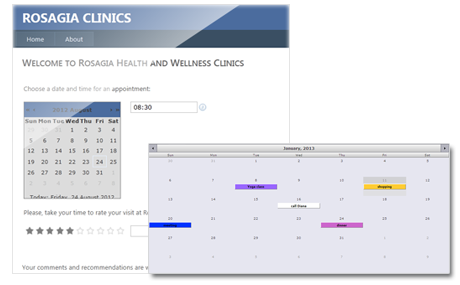 You can specify the appearance theme, the alignment of text and the position of the popup calendar selector. The TimePicker is very easy to use and customize - you can set the start and end hour as well the intervals between time stamps shown in the popup time selector. You can also choose how the popup selector is aligned. 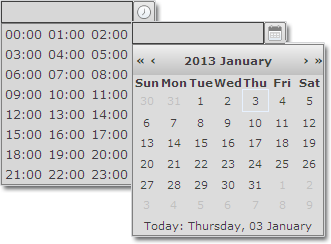 The Calendar control supports themes, a variety of events and the ability to set the current date. You can choose among six appearance styles, get the currently selected dates, set a CSS style for the header and footer, choose the selection mode and many more. Rating control lets you choose among 3 modes to display the value - precisely, discretely or in halves. It supports customizable orientation, themes and count of items. Withthe NumericUpDown control you choose the maximum and minimum values, the text alignment and the theme. The display type could be number, currency or percent. You can choose the number of decimal digits that are displayed after the floating point and the group separator for thousands.